This is an example eHealth Concept Drawing created on the Dragon1 Platform on which you as Business Professional can learn, create, share and control interactive content. What is an eHealth Concept Drawing? An eHealth Concept Drawing is a visualization that shows in a non-formal way the basic and dynamic structure of the eHealth concept. 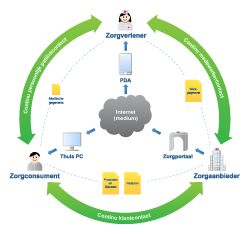 This visualization can be used to communicate the essence of the eHealth concept, the way it works, its concept principle. This example is in Dutch. How is this Concept Drawing build up? This Concept Drawing show the most important elements of eHealth and how they should collaborate. With this Concept Drawing of eHealth, you can communicate, develop and monitor eHealth in your organization effectively. Speed up Results You can have your version of a Concept Drawing for eHealth after days by only updating the example. We hope we have inspired you to start creating eHealth Concept drawings. You can just start by dragging and dropping the template of this example in your Digital Workplace and create concept drawings by yourself in a plain or specialized tool, such as Dragon1 as EA Tool.